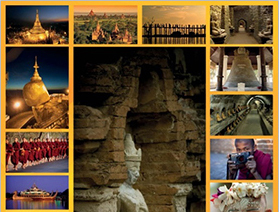 Myanmar Shalom offers “The Lost City of Mrauk U” tour. The ancient city of the Rakhine Kingdom (15th Century), is known for its old temples with paintings showing Indian cultural influence. Mrauk-U offers a number of important archaeological sites and several temples of unique design. Mrauk-U can be reached by boat traveling up river from Sittwe (Akyab), the capital of Rakhine State. The boat trip takes about 5 hours from Akyab. No.70, 31 Street, Pabedan Township, Yangon, Myanmar. 206 W, 109th Street #2B New York, NY 10025.